The techniques used to create 30 Miles East of LA are very simple using basic software. The movie has 3 tracks: video (created in FotoMagico), music, and voiceover (both tracks added in iMovie HD). 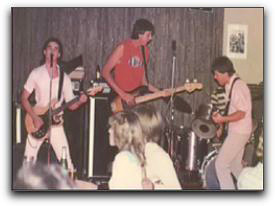 In this podcast, I talk about how the project began 2 years ago when I digitized the 20 year-old tapes of the band's music. I then began collecting and scanning the visuals, and even returned to Southern California to photograph the locations where the band performed 2 decades ago. If you're interested in saving some of your old cassette tapes, you may want to read the article, Five Fun Ways to Play with Audio Hijack Pro. It describes how to use Audio Hijack to convert analog tapes to digital files. Now that I've piqued your curiosity, it's time to listen to today's audio show titled, "The Making of 30 Miles East of LA." You can download the podcast here (29 minutes). 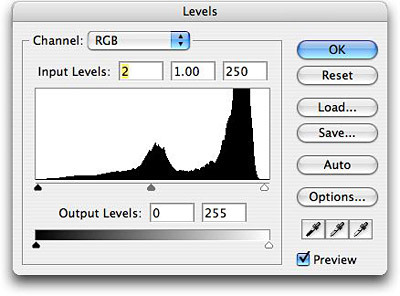 How do you build a basic image processing workflow with the tools you already have? It's quite easy and involves only a few steps. This workflow might not be as convenient as what you'd enjoy in a contained environment, such as with Aperture, Lightzone or Adobe's Lightroom, but you don't have to spend the dollars either. You don't have to spend more time managing your images on your computer than you did capturing them in the first place. I'll show you how to work more efficiently. Now that I've piqued your curiosity, it's time to listen to today's audio show titled, "Image Editing Workflow." You can download the podcast here (32 minutes). Exploration is in the air. It's vacation time! All of the techniques we've been thinking about, equipment we've been accumulating, and plans we've been making are about to be put in motion. I'm one of those strange people who actually enjoy packing for a trip. In this podcast, I talk about camera choices, bag selection, accessories, and tips for on the road. Now that I've piqued your curiosity, it's time to listen to today's audio show titled, "Vacation Packing." You can download the podcast here (32 minutes). 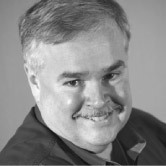 Now that I've piqued your curiosity, it's time to listen to today's audio show titled, "Killer Shooting Tips with Scott Bourne." You can download the podcast here (22 minutes). In digital imaging, your master files are the equivalent to film negatives in chemical photography. I recommend that you start by capturing the highest quality possible with your camera. If you shoot RAW, you're already getting the most your camera has to offer. 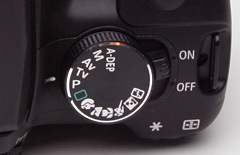 Jpeg shooters need to set their preferences to the highest quality settings available. Then, after you've uploaded the files, you can make copies of your master files for your various needs. I provide a nice overview of this workflow in this week's podcast. Included in the discussion is how to create a master movie then export versions for specific output. This can be particularly handy for your FotoMagico Slideshow Showcase entry. Now that I've piqued your curiosity, it's time to listen to today's audio show titled, "The Concept of Master Files." You can download the podcast here (32 minutes). We love our photo bags almost as much as the cameras tucked safely inside. This week I chat with Suzanne Caballero, who is a camera bag expert. She works for Lowepro; they've been designing great bags for over 30 years. During our conversation, Suzanne shared a few stories about famous photographers she's met through her work as Marketing Communications Manager. First she talked about Greg Gorman, who is a well known portrait shooter with a wonderful studio in Northern California. Suzanne also talked about Seth Resnick, a legend too, who is doing much to promote digital photography across the world. She even chats about her first photo expedition to Death Valley with John Isaac. Great stuff! The Stealth Reporter AW Digital Series that Seth Resnick helped design. The Classic Rolling Bags that Greg Gorman uses. And her personal favorite, the SlingShot 200 AW. And finally, here's the link to first story and the second story she told about Lowepro bags saving more than just camera gear. 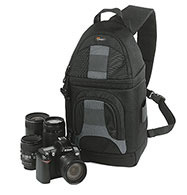 Now that I've piqued your curiosity, it's time to listen to today's audio show titled, "Camera Bag Chat." You can download the podcast here (34 minutes). First, take a look at New Life for Old Photos, then you might want to read Selecting a Scanner. You might also be interested in Tools for Turning Back Time. And finally, don't forget my podcast titled, Scanning Tips. Plus, here's some more info about my slideshow tip, Use Existing Signs for Titles. This tip is to help you prepare your entry for the FotoMagico Slideshow Showcase. Submit your Entry Form today (to get on the books), then start working on your presentation. Deadline to submit Entry Forms is May 30, and your presentation itself is due by June 15. Now that I've piqued your curiosity, it's time to listen to today's audio show titled, "Mailbag - Digital Photography Q&A." You can download the podcast here (28 minutes). Powerful multimedia presentations of your pictures will enhance their impact on viewers. And few tools in the photographer's bag of tricks are more compelling than slideshows. This episode begins a month long journey into the craft of building great slideshows. As part of this endeavor, I'm announcing the FotoMagico Slideshow Showcase, which is an opportunity for you to master the art of slideshow presentation and share samples of your work with the world. Here's how it all unfolds. In this podcast I'm discussing how to pick an appropriate subject and am offering some ideas for getting your tools together. Then, as we work through the month of May, I'll be providing tips for building your show, adding audio, making titles, and fine-tuning your presentation. The goal is that after a few weeks, you'll have your slideshow project in production and will be able to submit an entry form to the FotoMagico Slideshow Showcase. Then in June, we'll select 10 entries to feature on The Digital Story and send out a press release with the names, bios, web site links, and pointers to all of the showcased presentations. This is an excellent opportunity to shine a light on your photography. Anyone over 18 can enter. Slideshow entries must be between 1-4 minutes in length. The dimensions of the slideshow can be no more than 400 pixels in any direction. 320x240 is the recommended size. Music and/or voiceover is permitted, but not required. You need to complete an Official Entry Form by May 30 for each slideshow submitted, but you can submit as many shows as you wish. If you wish to use FotoMagico to create your show, you can get a $10 discount off the software by entering "Digital Story" in the discount code box. Visit the order page and select FotoMagico. You'll be able to enter a coupon code at the first checkout page. The code is set to "Digital Story". Once the code is input, and the Checkout button is clicked, the $10 discount will be reflected on the final order total page. 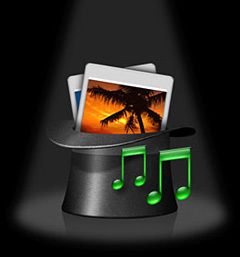 You may also use other software to author your slideshow, such as iPhoto 6 (Mac), QuickTime 7 Pro (Mac/Windows), and Photo Story 3 (Windows XP), just to name a few. As the month goes on, I'll publish tips and tricks for adding polish to your creation. The FotoMagico Slideshow Showcase also serves as our Photo Assignment for the month of May. You can send in your entry form before your slideshow is completed (to let us know that you're working on your presentation). In fact it's recommended. Entry forms are due by May 30. The actual slideshows are due on June 15. You can complete and submit your entry form here. Now that I've piqued your curiosity, it's time to listen to today's audio show titled, "Sensational Slideshows." You can download the podcast here (32 minutes). How do you find you photographic vision? 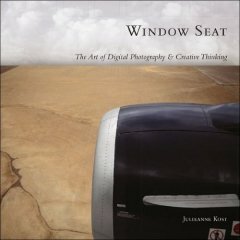 I interview Julieanne Kost, the author of Window Seat: The Art of Digital Photography and Creative Thinking, about how her compelling project came to life, and how it's changed her as a photographer. 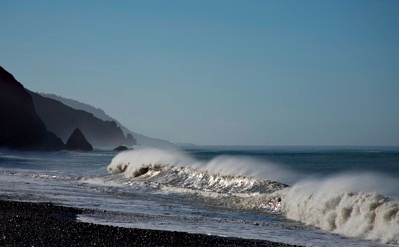 "I've so enjoyed taking pictures on one subject matter," said Julieanne. "The project just kept growing and growing. Over a course of 5 years I took more than 3,000 pictures." Julianne has included 150 of the best images in her book Window Seat. The conversation covers the process of choosing your best images, how to evolve as a photographer, and lots of insights from a truly irresistible artist. Now that I've piqued your curiosity, it's time to listen to today's audio show titled, "Julieanne Kost on Photo Vision." You can download the podcast here (23 minutes). If you have an ongoing photo project, or are considering one, tell us about it in the Comments field. Be sure to include a link if you have samples published.